It’s rare for us to post things from Etsy but this clock is so unusual we just had to. The crafter cuts out the clock from an unplayable record with her laser machine . . . in her Alpine, Texas kitchen! The quartz movements are made in the US too. Want a different record? Ask her if custom orders are possible. $25 + $10 for shipping in the US. Thanks to David S. in Japan for this find! 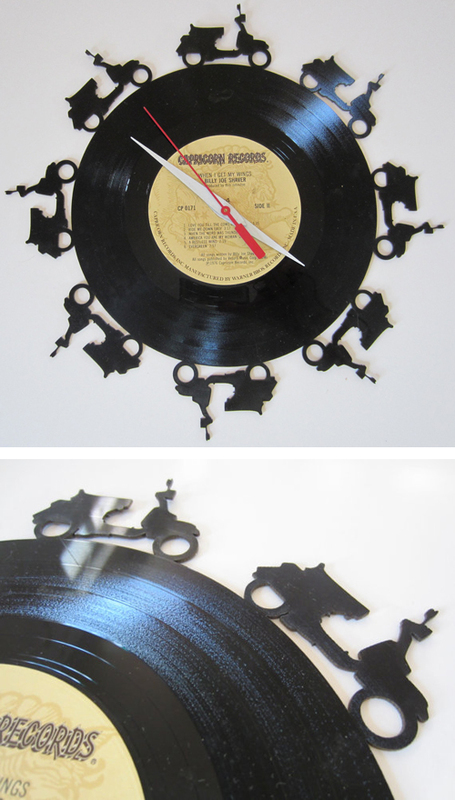 This entry was posted in Art, Crafts, Decor and tagged clock, etsy, laser cut, lp, record, scooter, vespa, wall by Tracy. Bookmark the permalink.